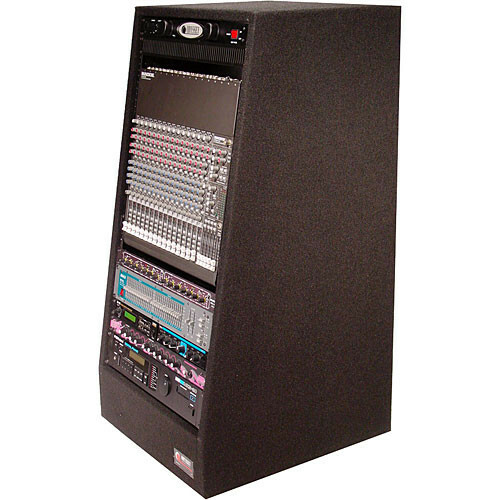 The CRS20 Carpeted Studio Rack with Casters (20U) from Odyssey Innovative Designs is a durable studio rack designed to provide years of solid use. It is constructed from 3/4" plywood that has been covered in a layer of protective carpet. Both the front and the back panel of the rack are open to facilitate access and management of your equipment. Pre-tapped metal rackrails are a standard feature, meaning the rack is ready to accept your equipment without any special installations or configurations. Casters on the rack also make its movement about your work area an easy task. This model offers 20U of rack space. Solid construction of 3/4" plywood and a carpeted exterior ensure years of reliable use with this rack. The rack features pre-installed rackrails that are ready to accept your equipment. Both the front and rear panels of this rack are open for easy access and management of your equipment. This rack includes casters that facilitate movement of your equipment about your work area. Box Dimensions (LxWxH) 44.0 x 23.0 x 0.0"